By purchasing ZX Enterprises Inc. ("Zero Xeno") products at our webstore you are agreeing to the Zero Xeno Terms of Service and you are agreeing to be bound by the following terms and conditions (“Terms of Service”). Any new features or tools that are added to the current Service shall also be subject to the Terms of Service. You can review the most current version of the Terms of Service at any time. Zero Xeno reserves the right to update and change the Terms of Service by posting updates and changes to the Zero Xeno website. You are advised to check the Terms of Service from time to time for any updates or changes that may affect you. Information provided on the Zero Xeno website is intended to be an informational guide and should be not be used for self-diagnosis, nor be taken as medical advice. Information on Zero Xeno does not substitute for advice given by a naturopathic doctor, master herbalist or medical doctor. If you suspect that you may have a medical problem, you should always promptly contact your physician before trying new health products. Results may vary among individuals. Zero Xeno does not attempt to offer or render a medical opinion or otherwise engage in the practice of medicine. You are responsible for keeping your password secure. Zero Xeno cannot and will not be liable for any loss or damage from your failure to maintain the security of your account and password. You may not use the Zero Xeno service for any illegal or unauthorized purpose nor may you, in the use of the service, violate any laws in your jurisdiction (including but not limited to copyright laws) as well as the laws of Canada and the Province of British Columbia. You are responsible for all activity and content (data, graphics, photos, links) that is uploaded under your Zero Xeno account. You must not transmit any worms or viruses or any code of a destructive nature. You understand that your Content (not including credit card information), may be transferred unencrypted and involve (a) transmissions over various networks; and (b) changes to conform and adapt to technical requirements of connecting networks or devices. Credit Card information is always encrypted during transfer over networks. We may, but have no obligation to, remove Content and Accounts containing Content that we determine in our sole discretion are unlawful, offensive, threatening, libelous, defamatory, pornographic, obscene or otherwise objectionable or violates any party’s intellectual property or these Terms of Service. You expressly understand and agree that Zero Xeno shall not be liable for any direct, indirect, incidental, special, consequential or exemplary damages, including but not limited to, damages for loss of profits, goodwill, use, data or other intangible losses resulting from the use of or inability to use the service. In no event shall Zero Xeno or our suppliers be liable for lost profits or any special, incidental or consequential damages arising out of or in connection with our site, our services or this agreement (however arising including negligence). You agree to indemnify and hold us and (as applicable) our parent, subsidiaries, affiliates, Zero Xeno partners, officers, directors, agents, and employees, harmless from any claim or demand, including reasonable attorneys’ fees, made by any third party due to or arising out of your breach of this Agreement or the documents it incorporates by reference, or your violation of any law or the rights of a third party. You agree not to reproduce, duplicate, copy, sell, resell or exploit any portion of the products, use of the products without the express written permission of Zero Xeno. Verbal or written abuse of any kind (including threats of abuse or retribution) of any Zero Xeno customer, Zero Xeno employee, member, or officer will result in immediate account termination. Questions about the Terms of Service should be sent to Zero Xeno Support. Our online system will forward your order to one of our account managers for review. We will email you back to confirm your order. A valid credit card is required for accounts able to process orders using a live payment gateway. All fees are exclusive of all federal, provincial, state or other governmental sales, goods and services, harmonized or other taxes, fees or charges now in force or enacted in the future (“Taxes”). If you are a resident of Canada, you are responsible for all applicable Taxes. These Taxes are based on the rates applicable to the Canadian billing address you provided to us. Such amounts are in addition to payment for the Plan and will be billed to your credit card. The prices in this online catalogue are all in Canadian dollars, and do not include federal and provincial taxes. Prices are subject to change. Notice regarding price changes may be provided at any time by posting the changes to the Zero Xeno website. 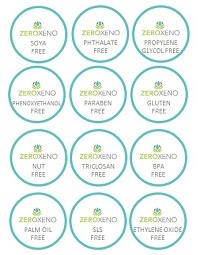 Zero Xeno reserves the right at any time to modify or discontinue, the product with or without notice. Zero Xeno shall not be liable to you or to any third party for any modification, price change, suspension or discontinuance of the Product. We do our best to keep products in stock, however we cannot guarantee that all products will be available at all times. Orders are generally shipped within 3 business days of the latest order date. We take great care to ensure that our orders are perfect, well-packaged and delivered in good condition. Unfortunately, errors can occur and products may be damaged during transportation. In the event of error, contact our Customer Service Department and we will help resolve the issue so you are 100% satisfied.